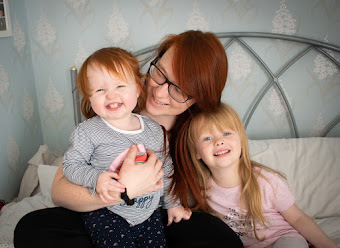 When I found out I was pregnant with Isabelle, one of the first things that I started to question was how would I manage to get out and about with two? I know many people do it, but how? Emily has always been a confident walker, and she stopped using her stroller when she was about 2years 6 months, so naturally, I knew that she wouldn't want to go backwards and it would have been a waste of money for us to get a double buggy. Then I started to think how difficult shopping trips would become, I don't drive, so if I want to go to town, or our local tesco, I have to get on the bus and then rely on Emily walking around and staying with me. I used to take her stroller if we were going to town, so when she was being a little difficult I could pop her in there and carry on with my shopping, now I have Isabelle that isn't really an option. Thats when I started to look into getting a buggy board, I have seen many people use them before, but never envisioned having one myself. When Kiddies Kingdom reached out and asked if I would like to review one, I kindly accpeted. It would be the perfect time to test it out and see if Emily would actually use it. Now I have to admit, I thought she would refuse to use it, or be a little resistant but its been the complete opposite, she loves it - and now we have one I couldn't see us not having one. Emily loves that she can stand on my pushchair when her legs get a little tired or she is just being lazy. She is able to look in and see Isabelle, chat away to her, and I like knowing that she is right there, safe and sound - and if I'm honest I love the fact I can get her to jump on, and I can walk a lot faster with her on there than waiting for her to trail behind me. The buggy board was really easy to fix to my Britax affinity 2, it was so simple and I was able to do it fairly quickly. I have the Bumprider which is a universat fit ride-on board that will fit any pushchair, stroller, pram or buggy allowing your toddler to ride when they get too tired to walk. It has smooth suspention which reduces stress on your child's knees and connectors that can be adjusted in width, length and height, the universal connector gives almost endless adjustments. It also has a quick release and mounting mechanism for easy fitting and removal. Emily loves the buggy board, and I love the fact it doesn't stick out massively. When she isn't using it, I can simply tuck it away under the pushchair meaning I'm not constantly tripping over it. It is suitable from children the age of 2 to 5 years of age, and up to 20kg. It also has an anti-slip surface. 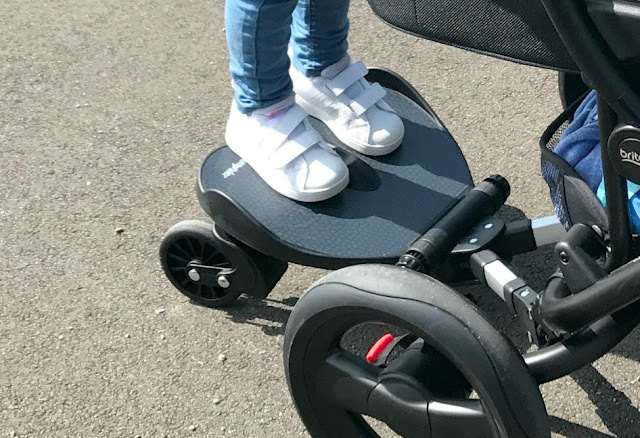 Overall, I am really impressed with the Bumprider, it has been a massive hit with Emily, its durable and sturdy not to mention its really easy to attach and detach from my pushchair. I also think that it is reasonably priced at £69.99 considering most buggy boards on the market are a lot more expensive than this. I'd love to hear your opinions, did you use a buggy board with your children?